Jose Briceño (bree-SEN-yo)... Participated in Venezuelan Winter Leagues with Navegantes del Magallanes in 2014, 2015 and 2017... Originally signed by Rockies scouts Francisco Cartaya and Ronaldo Fernandez. After beginning the year with Triple-A Salt Lake, had contract selected by the Angels May 20th...Made Major League debut May 26 at Yankee Stadium, singled in second at-bat and homered in fourth AB (2/4, HR, 2 RBI)... Became seventh player in Angels' history to homer in his Major League debut...Hit second career home run May 31st in second career start, becoming the first Angel to homer in their first two Major League starts... Collected pinch-hit home runs Sept. 23rd and 24th...Joined Jack Howell (May 15 & 17, 1996) as the only players in franchise history with pinch-hit home runs in consecutive games... Despite playing only 29 games with Triple-A, eight home runs were tied for seventh on the Club... Was an non-roster invitee to Spring Training. Spent majority of 2017 with Double-A Mobile...Slashed to .194/.242/.316 in 92 games with the BayBears...Also appeared in three games with Triple-A Salt Lake...His nine home runs marked most since a career-high 12 in 2014 ... Named Angels Organizati onal Defensive Player of the Month for April 2017...With Mobile in 2017, threw out 41% of base stealing att empts (34/83). Split 2016 season with Single-A Inland Empire and Double-A Arkansas...Named Texas League Player of the Week (July 4-10; .455/.478/.909; 6 2B, 2 3B, 7 RBI). March 22, 2019 Los Angeles Angels optioned C Jose Briceno to Salt Lake Bees. August 30, 2018 Los Angeles Angels recalled C Jose Briceno from Salt Lake Bees. August 15, 2018 Los Angeles Angels optioned C Jose Briceno to Salt Lake Bees. May 20, 2018 Los Angeles Angels selected the contract of Jose Briceno from Salt Lake Bees. February 6, 2018 Los Angeles Angels invited non-roster C Jose Briceno to spring training. October 10, 2017 C Jose Briceno assigned to Navegantes del Magallanes. August 31, 2017 C Jose Briceno assigned to Salt Lake Bees from Mobile BayBears. April 5, 2017 C Jose Briceno assigned to Mobile BayBears from Salt Lake Bees. February 2, 2017 Los Angeles Angels invited non-roster C Jose Briceno to spring training. September 1, 2016 C Jose Briceno assigned to Salt Lake Bees from Arkansas Travelers. May 16, 2016 C Jose Briceno assigned to Arkansas Travelers from Inland Empire 66ers. April 6, 2016 C Jose Briceno assigned to Inland Empire 66ers. November 12, 2015 Atlanta Braves traded SS Andrelton Simmons and C Jose Briceno to Los Angeles Angels for SS Erick Aybar, Sean Newcomb, RHP Chris Ellis and cash. October 31, 2015 C Jose Briceno assigned to Navegantes del Magallanes. September 18, 2015 C Jose Briceno assigned to Navegantes del Magallanes. June 16, 2015 Carolina Mudcats activated C Jose Briceno from the 7-day disabled list. June 10, 2015 Carolina Mudcats placed C Jose Briceno on the 7-day disabled list. April 6, 2015 C Jose Briceno assigned to Carolina Mudcats. April 1, 2015 Jose Briceno assigned to Atlanta Braves. January 30, 2015 Atlanta Braves traded RHP David Hale and RHP Gus Schlosser to Colorado Rockies for C Jose Briceno and C Chris O'Dowd. November 20, 2014 C Jose Briceno assigned to Navegantes del Magallanes. April 26, 2014 Asheville Tourists activated C Jose Briceno from the 7-day disabled list. April 19, 2014 Asheville Tourists placed C Jose Briceno on the 7-day disabled list. March 31, 2014 C Jose Briceno assigned to Asheville Tourists from Grand Junction Rockies. September 4, 2013 C Jose Briceno assigned to Grand Junction Rockies from Asheville Tourists. August 5, 2013 Jose Briceno assigned to Asheville Tourists from Grand Junction Rockies. June 10, 2013 Jose Briceno assigned to Grand Junction Rockies from Tri-City Dust Devils. May 1, 2013 Jose Briceno assigned to Tri-City Dust Devils from Asheville Tourists. April 15, 2013 Jose Briceno assigned to Asheville Tourists from Grand Junction Rockies. April 4, 2012 Jose Briceno assigned to Colorado Rockies. October 10, 2011 C Jose Briceno assigned to Navegantes del Magallanes. 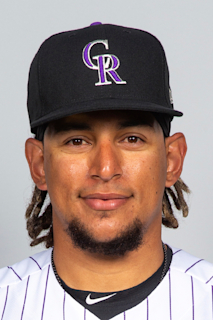 May 29, 2010 DSL Rockies signed free agent Jose Briceno.